the surprise Labor Day Telethon Appearance. It also contains a C.D. featuring over an hour of studio takes of the song "New York City"
for the first time in true stereo. Plus a remaster of the Telethon audio. 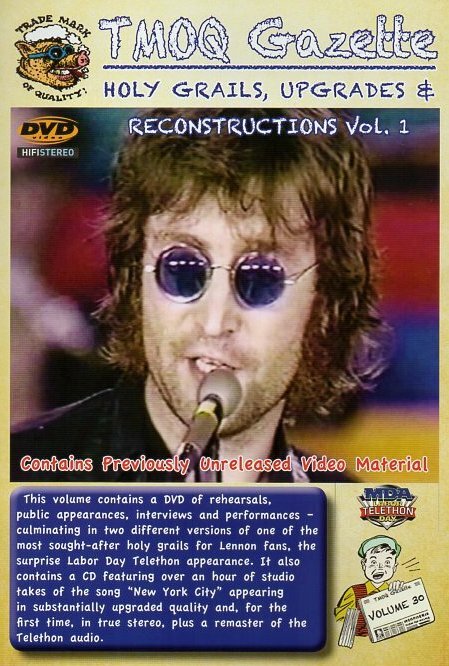 It also has a page about the background to John being in New York, a write-up about the DVD and the C.D. John's love affair with New York City and appearances in town, plus a brief history of the Jerry Lewis Telethon. "Several Times In New York City"
featuring John and Yoko working out and rehearsing Luck Of The Irish. Raw colour footage of an outdoor interview for NBC News. Rare CBS colour footage taken outside the Immigration & Naturalization Services in NYC. John and Yoko's surprise appearance at the annual Jerry Lewis Muscular Dystophy Telethon. Filmed at the Americana Hotel at 811, 7th Avenue (now the Sheraton Times Square Hotel). "Imagine", "Now Or Never" (a Yoko song) and "Give Peace A Chance". This first version is the original black-and-white broadcast that actually went out. It includes donation telephone numbers superimposed over the picture. 6 The Labor Day Telethon A studio in-line recording of the Telethon appearance in colour ! As would have been seen on the studio monitors, without any superimposed graphics. The audio and video quality are also superior. 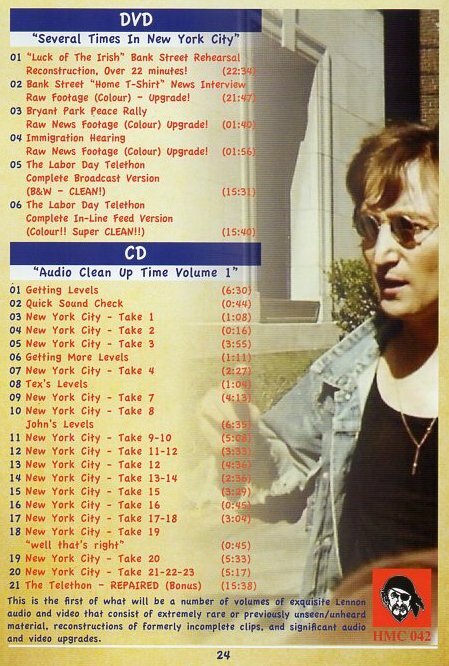 "Audio Clean Up Time Volume 1"
13 New York City - Take 12 "This is take number 2"
15 New York City - Take 15 "John, let's go again from the same spot"
So, a count-in into the fade-out. 17 New York City - Take 17-18 Misses words in final verse and breaks down. 18 New York City - Take 19 "Well, that's right, alright ...."
19 New York City - Take 20 At start, "We'd like to do a number for Mayor Lindsay". At end, "I don't think it was as good as the other, but it was a lot of fun"
©2017 - JPGR's Beatles Pages. All Rights Reserved.